Every February I eat out of my freezer. 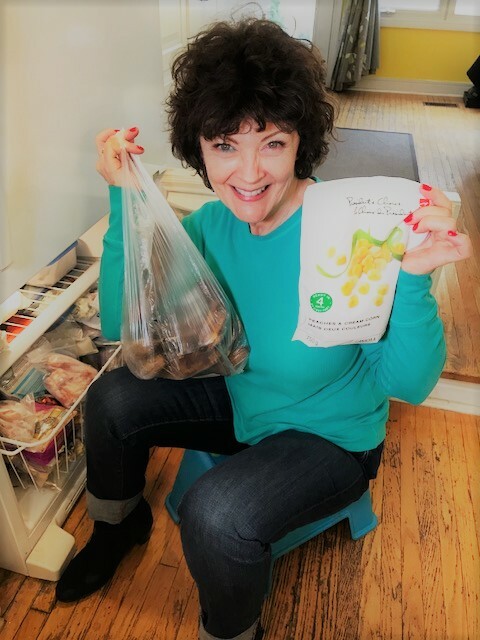 Basically, I shop my freezer before I head to the grocery store, planning menus based on what I already have. This way I’m saving money and cleaning out my freezer all at the same time. I love coming up with creative ways to use up the food. For me it’s like playing, not working. 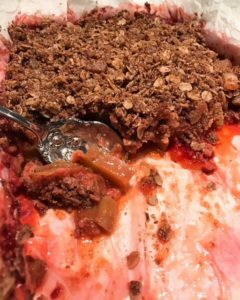 The other night we had a Rhubarb and Strawberry Crisp using the rhubarb and strawberries I found at the very back of the freezer, a taste of summer in the middle of winter, yum. Note: I never write down the recipe when I’m free styling, because that would be more like working than playing. I have three freezers…..what can I say I cook for a living. So, when I say we eat out of the freezer, I should clarify, we eat out of three freezers. That’s a lot of food, a lot of playing and a whole lotta eating. I’ll be posting the end results on Instagram and Facebook. Tomorrow I’m making a Corn and Back Bacon Chowder because I found back bacon and frozen corn in my freezer. The episode was shot by my husband, he’d never done anything like that before, we didn’t really know what we were doing, so it was a bit of a Gong Show….but worth the watch. Loads of great tips. For a list of the foods you can and cannot freeze plus how long they last in your fridge and/or freezer see the chart below. The following recommended refrigeration times are for safety, and the freezing times are for quality. If you store properly wrapped food in your freezer the quality may be maintained for longer periods of time.